Screening of window and door units is one of the most common items to be overlooked while planning a project. Reason being, most people do not want to obstruct their view or distract themselves from the beauty and character of their newly furnished steel windows or doors. To overcome this obstacle, Steel Windows and Doors USA has partnered with one of the finest screening/shading manufacturers in the industry. In some cases, entire window and door walls can utilize a retractable screen/shade system which may be fully concealed within the wall cavity. In addition, our featured systems have the ability to withstand the elements, granting the client the versatility to mount them to the interior or exterior facing the elements. 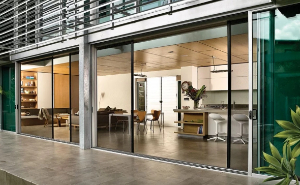 Steel Windows and Doors USA is proud to say that we offer the world’s first fingertip controlled screen system which provides insect screening and/or superior solar control. Offering a comfortable environment while promoting indoor-outdoor living, is the goal of Centor screens and shades. Centor Architectural offers the award winning screen/shade system S1 and the screen system S2. Not only does the Centor system allow the customer to have remarkable control of their living environment, but it does so in a way that best fits the needs of the space without compromising the style or feel of its surroundings. 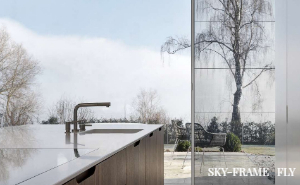 By effortlessly retracting horizontally into its sleek frame, the screen system is only noticeable when it needs to be as it sits concealed discreetly into its frame. Centor’s load balancing technology allows the screen/blind to be left partially open, allowing you to pass through without the hassle of opening or closing it all the way. It also remains firmly in any chosen position with tension across the surface to prevent the tendency for sagging. Additionally, the S1 screening and shading system comes in a full range of materials and finishes to best match the opening such as white, bronze, or clear anodized, and an extensive selection of custom paint finishes. Steel Windows and Doors USA works with the top manufacturers of steel, aluminum, and wood windows and doors. Our design solutions do not stop at window and door fabrication. Several of our manufacturers offer custom screens to best suit the product and project location. Contact us directly to discuss screening solutions for your custom window and door project.